Maurice asked me to be a guest at The Geek Twins ages ago – and we finally made it happen! Want to know who I think are the smartest and sexiest women in science fiction and why? Come on, you know you do! Then jump over and visit The Geek Twins, Maurice and Nigel, when you’re done here. Definitely not the sweet Disney version! This movie had an uneven pace. Certain scenes were well executed and visually stunning, like the faerie forest, while others dragged or seemed odd. I think in the hands of a better director this film would’ve been a major contender. The beginning was slow although it picked up once the dwarves appeared. Stewart did all right although the girl can’t smile to save her life. Ultimately, it was Chris Hemsworth who carried the movie. If not for him, it would’ve had no heart or soul. Certainly not a bad film but overall a bit disappointing. Full potential not realized. Anna Smith’s book, Alphabet Wishes, is now available – congratulations, Anna! Allison at Geek Banter is holding a Hundred Followers giveaway and you could win one of several Terry Brooks novels. Now that is a cool prize. Way to go, Allison! RaShelle Workman unveiled the cover art for her new book series, Blood and Snow. Looks awesome, RaShelle – you rock! And my BuNoWriMo progress is around 5000 words so far! This is Hart’s FIRST book release and I couldn’t be happier for her. She will be amusing the Ninja Army during her blog tour on June 18. Another great cozy mystery from Elizabeth, founder of the Writers Knowledge Database. The follow up to her debut novel, Possession! Elana will be entertaining the Ninja Army on her blog tour June 25. I’ve received many awards, including a couple new ones, and been tagged in a blog hop. In the interest of time, I shall do what I do best – be brief! I received the Fabulous Blog Ribbon from the energetic Cassie Mae. Name five of your most fabulous moments; five things you love; five things you hate. Passing this on to the happiest blogger I know, Morgan Shamy. Name something you do to take time for YOU – Easy – play my guitar. Passing this on to Laura Pauling who probably needs a nap after her blog tour. Vicki at Page After Page tagged me with the Be Inspired Blog Hop. Thank you Vicki – I will save that one for another day. Anyone else see Snow White and the Huntsman? Finally watch Hatfield and McCoys? (Surprised so many of you recorded it!) 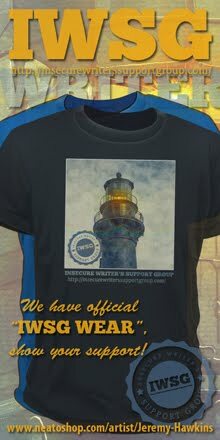 Participating in either Hart and Elizabeth’s or Elana’s book release blog hop/contests? Been awarded lately? 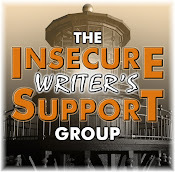 And if you are participating in BuNoWriMo or Camp NaNo, are you on track with your writing?Don't forget the next posting for the Insecure Writer's Support Group is this Wednesday! No, go visit The Geek Twins! Congrats on your BuNo progress! I am a little over 5000 words also, so staying on track so far! Lots of book releases today! Nice covers too. Best of luck to all my fellow struggling writers out there. Keep on fighting! I was curious about The Huntsman - now, not so much. One to leave until the DVD release methinks. Congrats on the awards well deserved. Owing to continuing family issues I find it hard to keep going on Blogland at the moment.I have no one to help me so will take some time out. See you in the future and thanks for everything. Congrats on the BuNo progress. I saw The Huntsman movie this weekend. I agree with your take on it. I thought it would've been better if anyone who wasn't Kristen Stewart played Snow White. But Chris Hemsworth was terrific. Oh wow!! Of course it's the Nakedest most Naked of all cozy mystery launch of lovely Tart!! So Down with Pants time! Yay!!!! Kyra, we're rocking the writing! Michael, I think a DVD rental works for Huntsman. Yvonne, will miss you while you're gone. Kitty, that will make Hart happy! Thanks so much for the mention, Alex! My daughter was talking about this Snow White movie, but it doesn't look like a kiddie movie! Thinking I might pass for her...and my son likely won't want to see anything with "Snow White" in the title, I'd guess! Leave it to Thor to carry the day. :) Cograts on all the awards and I am definitely hopping over to Geek Twins. I love their site. Yay on the BuMo count. Now if only I could get my own writing back on track. And I see that i have got some awesome new books to load up on. I'm right there with you with Snow White and the Huntsman, it had lots of potential...but they killed it by replacing character development and pacing with up close slow motion action scenes of Stewart...which I am guessing was supposed to be artistic, but in a battle scene just throws off the pace. Hemsworth (aka Thor) carried the movie. I still want to see Snow White and the Huntsman. Lots of great blog awards and releases listed up there! The only comments I read about the huntsman was about how loong it was. Guess that means the pacing wasn't great! I'm not a huge Kristen Stewart fan but it did look like a decent flick from the previews. I'm not sure I can tackle another blogfest this week- I've got Elana doing an interview wednesday but I can't wait to at least hop around and read the entries for the cozy one tomorrow! That should be fun! I'll watch Snow White and the Huntsman just for the visuals and nothing else, because apparently, it has nothing else to boast with. I have participated in nothing lately, I've gone incommunicado since early May... I'm thinking of continuing this until the fall... that's probably too long, but still, not being around has freed up a ton of time. I do have vacation coming up mid week too. Anyway, I didn't go see the movie this weekend, the missus is going to see it after work tonight, I'll get a review from her, she can be pretty insightful about movies so I'll get to know the real deal when she fills me in. Me, I'll be slaving away at last minute projects before we head out the door later in the week. Ugh. Holy moly, i'm outta breath just READING this post! So much going on over here in the land of Ninja!!! Elizabeth, it's really dark. Not for kids at all. Jessica, 3D can only help! Melissa, he did carry the movie. Sara, the pacing was so off for this movie. Katie, it could've used some serious editing. George, be curious what you thought of the film. Thanks Alex for sharing about Elana's blogfest. Too bad The Huntsman wasn't better. I was really looking forward to it. I'll still probably watch it when it comes out on DVD. Congratulations on your well-earned awards. Ooh, I want to see the faerie forest now! Too bad the movie seemed uneven, but my expectations weren't super high anyway. I agree with you about Stewart-she never smiles! I always think she looks like a sullen teenager. I agree SWATH could have used a better director. The visuals were beautiful, but there was about 45 min worth of story dragged into 2 hours. All great news! I look forward to the two book releases. And the Crazy Cozy Blogfest sounds like fun! Thanks for the award! :) I do need a nap! I'm participating in Elana's blogfest. I just have to think of a time I never surrendered. Hmm.. Snow White movie looked so promising. Still think I'll enjoy it when it comes to video. We were debating about seeing Snow White. Hmm...maybe I'll wait for it to go to DVD. Congrats on your BuNoWriMo progress!! Wow, so many great new releases. I'm going to check them out!! I absolutely LOVED Hatfield & McCoys. The History Channel might be my new fave channel. More, please. Haven't seen SNOW WHITE yet but plan to. That one looked dark and gritty. My sister and I did see THE AVENGERS, though. Was very disappointed in that one! Chris Hemsworth is the only reason I'd want to see Snow White. Delighted for all three authors with book releases tomorrow. Congrats on your new awards! I'll have to check out Allison's giveaway The new Snow White movie looks cool from the reviews, I just wish they had picked someone other than Stewart. You're doing great with your WriMo challenge! Awesome! I did see it yesterday. I enjoyed the special effects and Hemsworth. He was great. I'm not a fan of Stewart. I couldn't help but think she wasn't fairer than the queen. Congrats on your progress. I've not seen the Snow White movie. I intend to. The special effects look so cool, but Kristen Stewart sort of put the brakes on my want. Maybe when it's out on DVD. I'm bummed that Snow White didn't live up to its previews. But I still want to see it. I'm glad Snow White and the Huntsman was moderately successful at the box office this weekend, and better received by both critics and moviegoers than Mirror, Mirror. I'll definitely be waiting for it to come out on Blu-ray and DVD though. I was looking forward to the Huntsman but now I may way for the DVD release. Thanks for the review. All ready for Wednesday too! Like the book cover of Assault by Alyse Carlson. So excited for Hart Johnson! Way to go. Congrats on the BuNo progress. Sounds like The Huntsman was as good as that Red Riding Hood moving that came out a few years ago. Rusty, take your time and work on your projects. Sometimes a break is good. Cathy, I never lack for blog post material! Baygirl, you need to watch it soon. Rachel, I guess she's also really shy in real life. Kimberlee, that's true. There were scenes missing. And it was much too long for the material. Michael, that seems to be everyone's complaint. Michael, the box office take exceeded studio expectations. Jaybird, he was the best part. Hooray for Elana and your new blog awards! Hmm, thanks for the Snow White review. Seemed too good to be true! Heading over to The Geek Twins! Congrats on the awards; congrats to the new winners as well! I didn't end up seeing Huntsman this weekend but I'm planning to next week. Your review is similar to many that I've heard! I had decided I wouldn't be seeing The Huntsman. Various reasons. I did go see Mirror Mirror which I felt was more my speed. Well that is disappointing about Snow White. I'm not surprised Chris Hemsworth carried it. Thanks for the mention! and congrats to you & all the awardees and releasers! so much to shout about and you do it so well! I'll be watching both Snow Whites on pay per view. And I'm looking forward to RaShelle Workman's Blood and Snow. I was worried about the Snow White & the Huntsman, because of STEWART specifically. I'll still probably go see it, but....my hopes are not high. Congrats on the awards, and congrats on how much you've done for BuNo. Glad you reviewed the Huntsman. I'll go into it with lower expectations. Good luck on your writing today. Too bad The Huntsman didn't quite work. The trailer's great. Someone else said they were rooting for the Queen. I managed to catch the last two episodes of The Hatfields and McCoys. Depressing stuff, but riveting because it's true. neither of this years snow white movies got me excited enough to want to see them. Maybe once the both hit DVD I will watch and compare. I haven't seen Snow White and the Hunstman, but we'd planned on it this week. Now, I'm wondering if I want to see another movie about a classic tale I love, if that movie lacks heart. I still haven't recovered from A Christmas Carol. While it was amazing from a special effects point of view, the story was lost on me. I'm sure Dickens would have demanded his money back. Didn't see Huntsman ... but wife did ... she liked it. Great reviews and congrats on the awards! I'm bummed about the mixed reviews about Snow White that I'm reading online today. But it's still intriguing enough I maybe have to go see it. All the books you mentioned sound great! I know Elana Johnson's is already on my must-buy list! And thanks for stopping by my blog today (from Leigh's link/interview). I really appreciate! Hmm... OK, well thanks for that review of SW&TH! I was on the fence about it, and I can totally see how what you're saying could happen. Personally, canNOT wait for BRAVE & PROMETHEUS!!! Oh, so that's how you do the blogfest. I'm taking part tomorrow but I didn't know what I was suppose to do. Thanks! Congrats on your progress!!! Thanks for the movie review -sounds like a DVD flick. And all that awesome ninja news! Congrats to all those authors. Oh, you always have real interesting insights into movies. Glad I read this--maybe I'll wait until it's on DVD! Congrats to the new books coming out and all the amazing Ninja News. And for your progress on BuNo...! Lydia, I really wanted to like it more. Julie, you know what to expect then. Lynn, keep expectations low and you might enjoy it. Hilde, I haven't seen the other Snow White movie yet. Cate, Hatfields and McCoys was an excellent mini series. Mina, that's still a good pace. Leslie, and thank you for visiting me! LTM, I will buy it, promise! Clarissa, that made me laugh. Yeah i heard Stewart mostly looked constipated. I had a feeling that there might be problems with Snow White and the Huntsman. I'd still like to see it eventually, but I think it might be a better rental movie than movie theater one. Congrats on your BuNoWriMo word count and awards! Congrats to all the books coming out too! Heading over to The Geek Twins. Did you see the movie "Real Steel?" I can't remember if you reviewed it or not. What did you think if you did? Off to visit the Geek Twins! That's a lot going on! Thanks for the review of Snow White. I was considering seeing it, but may wait for the DVD release as there are so many good movies coming out. Thanks for the link to the Geek Twins. I want to watch the Snow White movie. Whew! That's a lot of stuff happening. I've been so busy with my book lately, I haven't had time for anything else. I haven't even been able to troll the blogs. Time to fix that. Thanks for all the updates. Congrats on all the progress! WOW! 5000 words! I'm impressed. Congrats to all the new releases this week in books too! Yeay Hart! I want to see Snow White and the Huntsman this weekend just to see if it is good. Yes, Kristen has an issue smiling. Good job get 5K written. *Claps* Keep on going, sir! I still need to read Possesion by Elana Johson. Too many books to read. I took a class by her about Blogging. She's super cool. She even gave us candy in the class. I'm waiting for Huntsmen to come out on DVD. However Hatfields and McCoys was good...brutal! So that's why Snow White isn't doing as well as it should. Well, I"m going to go watch it anyway, but at least now I know what to expect. Thanks for your movie reviews, Alex! Well done on the BuNo progress! Keep it up! I was sure Hart had books out already. Her blog seems so professional! Charles, I enjoyed it a lot more than I thought I would! Nancy, I'm writing as fast as I can. Julia, that's cool you met her! Heather, it was brutal all right. Nutschell, lower your expectations and you might enjoy it. I agree with your assessment of Snow White and the Huntsman. Still, I really enjoyed it. My son saw it and liked it overall but had mixed reviews as you did. The only reason I will go see it is because my son said it was worth it and I trust him more than most when it comes to movies. I've never been a Charlize fan and Christine Stewart hasn't done any acting worthwhile since Panick Room but I am a HUGE Chris Hemsworth fan. Ridley better not let me down. I'm looking forward to Prometheus. I still want to see Snow White, but figured it would be at least a partial bomb. Since the beach was calling this weekend, I've been out of the loop. Time to start checking everything out. Can't say I'll be running out to see Snow White & the Huntsman. I'll be waiting for when it gets to the theatre that only charges me $1.75. Big congrats to Anna! And to your 5,000 word count. Headed over to Allison's and RaShelle's now. Congrats on your well deserved awards. I am looking forward to seeing Snow White and the Huntsman. I feel the same way about Kristin Stewart by the way, giggle.Quilt or Innocence is on our book club summer reading list! Hugs and wishes for a beautiful week ahead. Your comments about the movie are exactly what I heard from others. They ragged on Charlize's horrible accent too. Oh well. I gave more money to The Avengers. Ahhh. Was even better than the first time! Was able to pay more attention to the dialogue and the sets. Really awesome. Glad you are writing! Great progress, sir! Wow, congrats on your BuNo progress!! That's awesome. Lots of great books coming out this week. That's too bad about Snow White and the Huntsman. You're right, though, Stewart is one broading individual. Congratulations on all of your awards. I'll have to check out the other bloggers you've passed the awards on to. Wendy, you're in luck that Hemsworth carries the film then. Katherine, Elizabeth will be excited to hear that! Heather, that was money well spent! Interesting take on The Huntsman. I've been on the fence about that one, so your insights are good! Congratulations on the awards and the BuNoWriMo progress. Thanks for the review - I was debating about seeing that one. Now I think I'll wait for cable. Best of luck to all on their new book releases. I wasn't intrigued by the commercials for Snow White and the Huntsman. It felt like it could have been a glorified Syfy flick but not as funny! Thanks for the movie review. Was on the fence despite daughter's desperation to see it. Congrats on your awards! I love your blog because I feel like it's like the blogger watercooler where everyone stops by to hang out and chat! Still waiting for the Hatfields and NcCoys over here and congrats on even more awards Alex! Congrats on the blogger awards. I didn't see any movies this weekend, due to that blah word called "work". It sounds as though Snow White is a bummer. I guess this will be another one I will wait to rent from Red Box. Loved the Hatfield's and McCoy's movie. Everyone's saying that Theron was the real master in Snow White, so I'm a bit surprised you didn't mention her. I'll be waiting for dvd for this one. It's overwhelming (in a good way) how many great blogger-authors are publishing. Thanks for always highlighting these. Morgan, you're a super happy blogger! Christine, definitely not as funny. Jeremy, now MI4 was a much better choice! Thanks, Lurker. Think you'll really like the series when you finally get to see it. Andrew, Theron was good, but Hemsworth the real heart of the film. 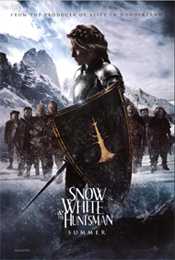 After reading your movie review I decided to pass on Snow White and the Huntsman. That's disappointing to hear about Snow White. Oh well. Congrats to everybody on the Ninja's newsfront! Tasha, that sounds like a plan! Edi, I really wanted to like it, but the more I think about the film, the more I see wrong with it. I was wondering about the Snow White movie... I can wait til it comes out on Netflix. Congrats to those with new book releases and to you, Alex and the adding of awards to your collection. Congrats on your awards! I still want to see snow white- though I have heard mixed reviews on like it's the best role for Stewart and such. Thanks for the review and the news! Congrats to Anna, Hart, Elizabeth, and Elana. Woot! Too bad the Huntsman was disappointing. Will wait for it to go cheap on dvd then. I've considered seeing that movie, but I just don't like Kristen Stewart. She can't act, though I wouldn't mind drooling over Chris Hemsworth. I'll have to go check out those books! Yeah, I've read a few unimpressed reviews of SWATH. I wasn't too keen on seeing it anyway - it seems like a remake of every fantasy movie ever made - but starring Bella and Thor. I've heard different things about The Huntsman. It's been moved to Netflix for me because it doesn't seem worth a movie trip. On my planet, we breathe oxygen and Charlize Theron is fairer than Stewart ... even with your eyes closed! I want to see it for Ms. Theron, but I will wait for the DVD release. PROMETHEUS is a go for next weekend! The ghost of Ernest Hemingway, Gore Vidal, and I are not fans of the novel-in-a-month craze. But we know we are in the minority! LOL. Jemi, I hope to read it soon. Krista, it might be worth it for you then. Lauren, at least Thor did a good job with his role! LG, you're not. And it's rare I don't see a movie on day one of its release. Suze, and your comment made me laugh! A shame Snow White wasn't better... I was really looking forward to it... will still watch it though:) Congrats on the awards. Once I saw Stewart was cast as Snow White, I didn't have high hopes. I'm so excited about Elana's new release. I'm not a mystery writer, but I'm ready to post for tomorrow's Crazy Cozy Blogfest. Stewart isn't much for smiling. Yay for Elana and your blog awards. Saw Snow White this weekend. Hemsworth and Theron were awesome. I read somewhere that they did something like 8 rewrites on this thing, so it became very muddled in editing. Hence all of the problems in the final draft. I think they couldn't make a decision about how they wanted it to end, so the whole thing turned out like what you saw: bad pacing, bad execution, and characters who didn't seem committed ENOUGH. It would have been better all-around had everyone decided what they really wanted and gone for it. Much more interesting to watch... and it would have solved all of those pacing problems because it would have given us *something* to watch. I haven't seen Huntsman...not my thing, but I agree about the smiling thing. And I'm so happy for Hart and Elizabeth!! Medeia, glad you're ready for tomorrow. Julie, I blog, they comment! I still want to see the Huntsman in the theatre, and by that I mean my wife does. She saw Dark Shadows with her girlfriend on Saturday night and was not impressed...so now I HAVE to see it!! You're making great progress with yor challenge. Keep it up. I haven't seen Snow White and the Huntsman though I've seen the trailer and wanted to see the movie. I can't help asking if Stewart, again, spent much of the moving with her eyes downcast as if the ground is trying to tell her something. I was hoping that wouldn't be the case, not with Chris Hemsworth to look at. I've known Hart for a while, and pre-ordered her book. I love a good cozy from time to time, and judging by her always a hoot blog, I won't be disappointed. Congrats on your awards! I have been wondering about the Huntsman. Cracking me up how you say that Stewart can't smile to save her life! LOL. So true! Aw, I'm bummed you didn't love love Snow White. That's how I felt about Dark Shadows. I'll probably still see it but now I know to keep my expectations in check. I'm definitely gonna see that movie, it looks cool. And I thought Stewart did a fab job in THE RUNAWAYS, but the rest of her stuff is a bit 2-dimensional I guess. I watched Snow White and the Huntsman and really thought some parts of it were way too long. I want to see the Huntsman, and I know this may be superficial, but it seems so unbelievable to me that Kristen Stewart is supposed to rival Charlize Theron in beauty. She's cute, but she's no Charlize. Chuck, all five seasons? That might take a while. Angela, the pouting look wasn't just reserved for the ground in this film! Jennifer, keep them low and you might enjoy it. Michael, part of that uneven pacing. Ella, he saved it as best he could. Missed, no, I totally agree with you! Disppointed to hear about SWATH but it did seem to good to be true. I'll still see it; I'm just not quite so excited now. I'd also like to see Dark Shadows but have heard that's a bit of a disappointment too. I thought the Huntsmen wouldn't be all that great. I'm glad I've not gone to the theature to see it. Maybe when it comes out. Not surprised about the Huntsmen but I'll see it when it comes out on DVD for Chris Hemsworth and Charlize Theron. Congrats on the awards and thanks for the book news too! That's too bad Snow White doesn't quite cut it. It seems like it really has potential. Thank you SO MUCH for the shout out for both my book and our blogfest!!! You're the dude, Alex! I agree, Enya's song fit The Lord of the Rings really well. Jenn, you are a Ninja! Yeah, I didn't even see Dark Shadows since so many were disappointed with the movie. Miss Jack, catch it on NetFlix instead. Great guest post Alex. Thanks for visiting. Keep up the BuNoWriMo progress! Haven't had a chance to see Huntsman yet, but I'm looking forward to it. So excited for Elana's release. I feel that bittersweet with Snow White and the Huntsman. I really like Snow White and the Huntsman, but I'd definitely agree that it had an uneven pace. And Chris Hemsworth definitely carried the film. I was surprised at how good he was (though I shouldn't have been after The Avengers). I will visit them straight away! I'm pretty sure that I'll be seeing the movie. Just need to find the time... Thanks for the review! Congratulations on your well deserved awards, Alex. I've been trying to follow your blog for months but alas, I am not tech savvy. Anyway, blogger finally allowed me to do it! I'm not at all surprised by your Huntsman review but would see it anyway because I love Chris Hemsworth. He could probably carry any movie! SL, he was the highlight. Pat, probably not many theaters in the desert! Lisa, thanks for not giving up! Congratulations on the awards and your BuNoWriMo progress! Thanks for the movie review. Phew! All the WriMo thinggies got my brain in a knot. I wonder if somebody could write a post explaining the JuNoWriMo, BuNoWriMo, NaNoWriMo, Camp-something-or-the-other... they pop up all over, like jack-in-the-boxes... any others I missed? Are they related? Like cousins or something? I haven't even seen Avengers yet. Snow White sounds good. I signed up for NaNo summer camp but haven't written word 1. Awesome so many people are releasing books! I think I need to do the NaNoWriMo camp in August in order to finish the November NaNoWriMo novel. And I can't wait to read Elizabeth's new novel and Hart's debut novel. I do love those cozies. A lot of stuff there Dude :) I'm glad The Huntsman isn't another Disney version; I'm in the mood for some dark fairy tale. I'll head over to Geek Twins. BTW: just reminding you you haven't played your guitar for me yet . . Sorry, I'm so behind on my blog rounds! Congrats on your awards!! They aren't ones I've seen before. I want to see Snow White and the Huntsman, even though I'm not expecting a lot from it. Ahaha, Kristen Stewart can't smile. So, so true! I haven't seen Snow White yet- but I have been wanting to see it since I first heard about it. I did watch The Hatfield and McCoy movie- all three parts. I thought it was fascinating and it has really made me think! Congrats on all the awards! Michelle, someone does need to do a post explaining them. Carrie, that's all right. It happens.